Some people use the terminology "Virtual PBX" to describe a service that provides PBX features when callers dial a specific phone number inbound only. These features are handled by the provider with their equipment located at their facility and can include an auto-attendant, which can route calls to extensions, departments or employees, play on hold music, take voicemail and then send that voicemail to email. They also handle numerous advanced call forwarding features like blast or ring groups, find me, follow me and can even take faxes. The service is quick and easy for a user to start and is reasonable in cost, but will be an additional expense over an existing regular outbound phone service, which will be kept. In many cases, the service will offer you a toll free number and charge a per minute fee when that number is called, plus perhaps, a small monthly fee. It is great for small on the go businesses which want to have a professional phone service with the advanced features that larger companies have. Finding the perfect business VoIP provider is the best way to help your business succeed. And by keeping your existing traditional phone or cell phone service, are only adding an additional service which will keep the upfront costs extremely low. A "Hosted PBX" meanwhile can be best described as a service that provides a PBX feature set handled by equipment located at the provider's location and routes both inbound and outbound calls. The features are robust, like a Virtual PBX and likewise usually include an auto-attendant, voicemail to email, and other advanced call forwarding features. In addition, they are or their partner is the telecom company that handles your phone number and routes outbound calls. In most cases they replace your current telecom company and will charge a fee based on either call minutes or have an unlimited monthly calling plan. Needed equipment will usually be IP phones, such as Polycom, Grandstream, Cisco, etc. and will connect through a router, some of the best being Edgemarc or Ingate. "With this information and a little research you shouldn't have to jump through hoops to get the service which is right for you and your company." It's easy to set up with no need to purchase equipment . Use your cell phone, existing land line or even a softphone (available free) for extensions. Moving physical locations is no big deal. Your virtual office may have roots in California one month and Connecticut the next, just have your provider point your "business number" to your current number . You need features and professionalism and may even want a toll free number for your business. Perhaps, at times you add or subtract associates/employees, but you don't see a standard office environment for some time, then this type of service could be ideal. The upfront cost may be limited to setup fees and the cost of IP phones or a CPE device (and perhaps a router). Your Internet connection needs to be stable and have enough capacity to handle the amount of extensions located at the premise. Larger companies with over 15 extensions at the same location might want to consider an on premise PBX solution or design and maintain a LAN/WAN network architecture that encompasses QOS. Stability of the provider. Although most providers strive for stability, the service may not meet your expectations. Expect a hiccup or two and the occasional failed call and/or bad quality call. Even then, some providers are better than others, and are more technically and financially stable. Hosted VoIP companies, just like web hosting companies, experience growth that can affect their entire network with capacity issues. 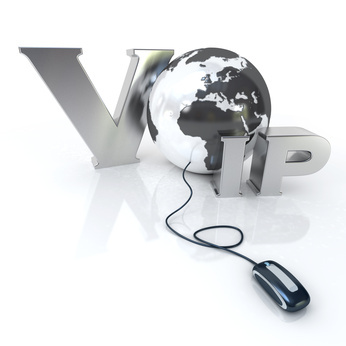 Additionally, while trying to drive down costs by changing partners, a VoIP provider's stability can be sacrificed. So do your homework and get recent information about any possible providers that you might consider. Stability of your Internet connection. Your Internet provider's stability and capacity along with their peering partners will greatly affect your calls. Remember that both calls and signaling are traveling over the Internet and your connection to your provider needs to be sound and stable. One strong point to remember, is that ISPs and Internet connections are getting better, bigger and cheaper all the time. Cost, including equipment, monthly reoccurring charges (monthly service plan) and international charges. Pricing is important, but it should not be the most important factor. Features and suitability are more important. That being said, pricing is a factor, so look at the entire package. Contract and equipment usability. Is there a contract, and if so what are the terms? If there is a cancellation clause, figure that in on the overall cost. If you purchase equipment, like IP phones or CPEs, are they locked down to the provider or can they be used at a later time with another provider? Depending on the answer, this could be a large additional cost. Support. One of the most important aspects of any service is the quality of the support you will receive. Not only the hours of operation, but the expertise and helpfulness of the employees. A service provider who scores low on customer service and technical support should be discounted.